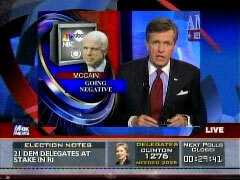 No real surprise here: A new study of positive versus negative campaign coverage found, as reported Tuesday night by FNC's Brit Hume, that John McCain's coverage grew more negative as he got closer to winning the GOP presidential nomination. A study of the three broadcast network evening news programs indicates John McCain's media fortunes have taken a dramatic turn for the worse since early January. The Center for Media and Public Affairs says the amount of McCain coverage it deemed positive was 46 percent from mid-December through mid-February. But look at the contrast between his 97 percent positive number before the New Hampshire primary on January eighth -- and just 30 percent positive since. Meanwhile, Barack Obama's overwhelmingly positive coverage has slipped a bit. Between mid-December and mid-February, Obama received 84 percent positive coverage. Hillary Clinton got 53 percent positive. But since Super Tuesday in early February, Obama's good press number is 67 percent. Clinton has also dropped slightly to 50. 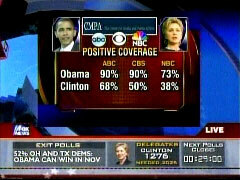 Breaking down coverage by network: ABC and CBS gave Obama 90 percent favorable coverage; NBC 73 percent. For Clinton: ABC had 68 percent positive, CBS 50 percent, and only 38 percent on NBC. One other note of criticism: Bill Clinton overall was heavy, with the former President receiving just 24 percent positive coverage for his role in his wife's campaign.